Thread: C.O.W. - #029: Tentacles - VOTING!!! It lives in the swamp waters of X4f and eats fish for the most part. Sometimes when the hunger is too big it will catch prey from dry land aswell though. 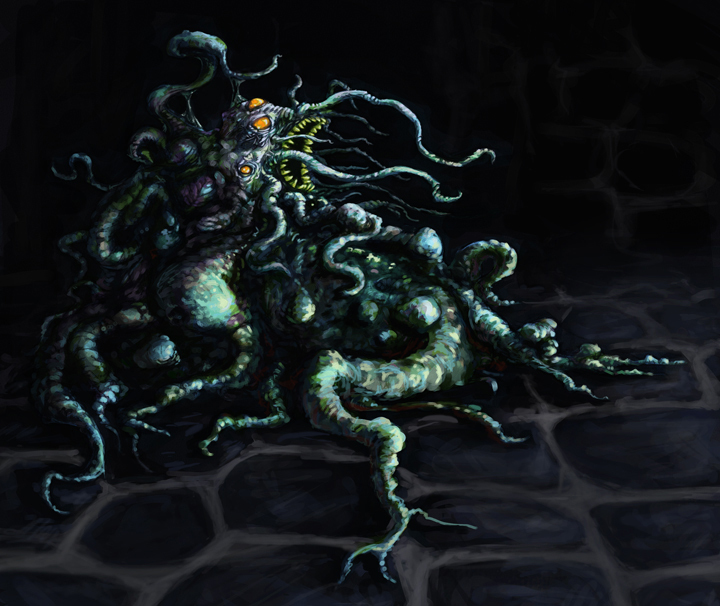 It digests its food by liquifying it from the inside via a poison that comes from the thorn in its trunk. humans aren't advised to go near waters where it resides as it seems to have developed a taste for manflesh recently. The rarely seen toilet squid. They feed off of the crocodiles that get flushed in the sewers. They avoid rats. There is a tale that is whispered in hushed voices by viking seafarers that brings an icy chill to even the most seasoned veteran of the ocean. It is the tale of the Tentacles of the Deep. Few sailors survive their encounter with these bizzare creatures. Those that do survive, mention that the tentacles appear only in the heaviest storms, when the waves are at their strongest. The creatures burst from the waves, wrapping themselves around the helpless ship, shattering it and pulling it under to the deepest depths of the ocean. No one knows why the tentacles strike when they do, or why they choose the ships. Some say they are summoned by a vengeful god of the ocean. Others believe that they are not seperate creatures at all, but the tentacled arms of a massive undersea creature that has not yet been seen in full. In either case, the tale of the Tentacles of the Deep cause even the bravest sailors to keep a white knuckled grip on the rails of their ship. In the deep swamps of Hungalo, there lives a snake-like species that is often mistaken for legendary monsters in stories passed down through tribal generations. 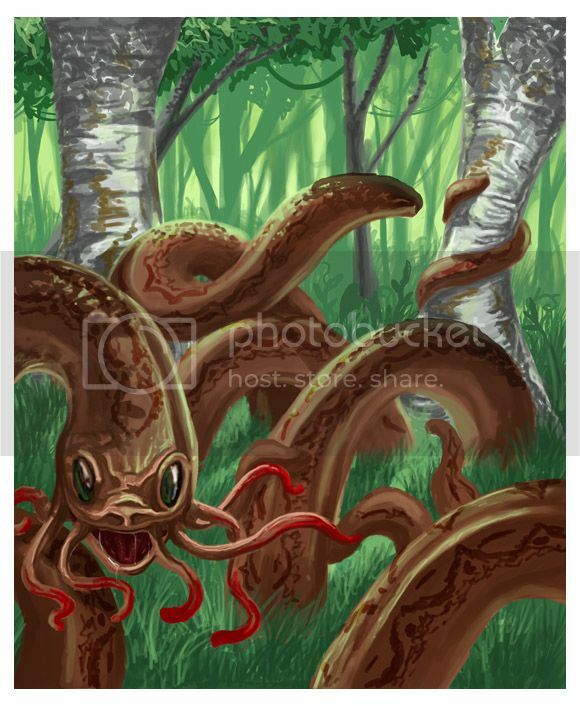 These monsters, often described as having a numerous amount of tentacles and killing any moving thing in it's vicinity, have terrorized tribesman for centuries. It wasn't until recent, that the mystery was finally solved. The species resemble a cross between a leech and a large snake. The females will migrate to an area of swamp that is known for a porous material and will attach itself to lay eggs. Many females have been known to attach themselves to the same spot, often confusing anyone nearby into thinking they have spotted one of these legendary monsters. The most interesting part of this creature isn't the creature itself but a rare, yet desirable, mushroom that grows off the top of this porous material while the females are attached. Many tribes value it because of its effects it has on the human body. Most die trying to get it. 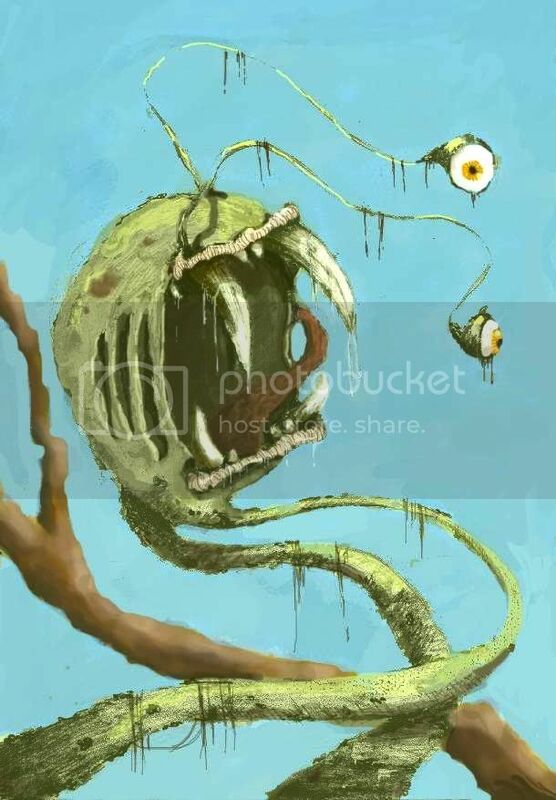 concept: Myoceum Occulimortia, more commonly known as an "Eye Vore", is found in or near the temperate oceans of Kloxxi 4. These amphibious parasites dine exclusively on the eye and optic nerve of their host. Eye Vores typically reach a maximum length of 1.25 meters and may live as long as a millenia. Typically ingested as eggs by large aquatic filter feeders (usually A full grown Jonke Slinthera(their favorite host) which can grow to as long as 8.5 kilometers and has twenty two pairs of large eyes(+/- 42 centimeters each). They hatch in the digestive tract and begin the journey to the optic region of their host. Once there, they bore through the sclera (optic wall). By utilizing the consumed scleral proteins they synthesize a gelatinous dermal coating that negates any immunosystemic reaction. Immediately following the excretion of their coating, they enter the vitreous portion of the eye, where they will remain for up to two years eating everything within the choroid membrane sans the ora serrata and the cornea. They will travel eye to eye repeating this process each time until the last eye at which time, they exit the host via the cornea. Upon exiting they begin their reproductive cycle. They are hermaphroditic and may or may not mate with another individual. A single vore typically produces six to eight thousand eggs per clutch. The eggs are equal in density to their aquatic habitat and therefore travel freely within its range. Notably, much of their diet consists of nerve protein which they primarily use to generate new cerebral tissue and subsequently neural pathways. Thus, adult vores are typically far more intelligent than adolescents, however the true extent of their intellectual capacity is as of yet unknown. concept: A Canver duck falling foul of the giant Skeel Worm, the worm is ingested by many animals (usually fish) in egg form however it will only develop in the gut of migratory aquatic birds, the worm will remain relatively small untill it senses a long period of flight followed by the impact of a water landing. After the bird has made its move to a warmer climate the worm will use the abundance of food to grow extremely rapidly, the results as you can see are unpleasant, the worm will digest its host using the enzymic muccus on its body then swim off to find a mate. 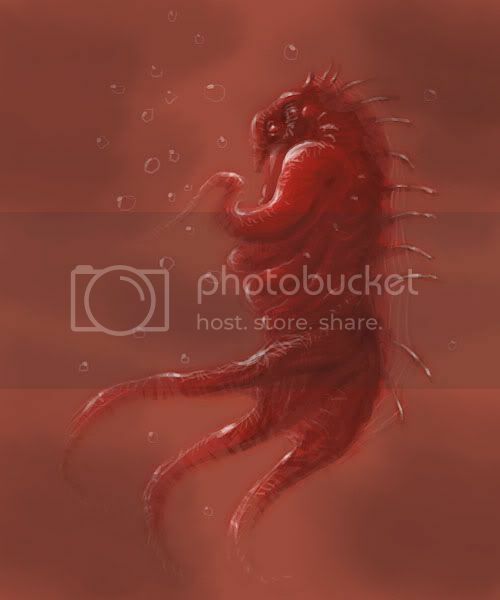 The Skeel Worm is named after it's discoverer, who was unfortunate enough to have one of these creatures in his gut, luckily a hot salty colonic caused the animal to vacate his body. The tsoglydon is an unusual type of creature. Living in the darkest of subterranean tunnels and dungeons, it feeds off anything it can scrounge. A sore sight of bumpy tumors and a mass of tentacles arranged in no apparent order of form, accept that the mouth always resides on, or near the top. Slow moving, it can catch prey by surprise with it's amazing elasticity, and pin-point accuracy. Multiple eyes randomly placed across the top of this mass allow 360 degree vision. Highly resistant to cutting and bludgeoning weapons, the most effective attack is with fire. Hyper-sensitive to light, the tsoglydon tends to contract its form into a close-knit mass for defensive purposes (as depicted). Solitary creatures, the tentacle snake is found in light forests with plenty of shrubby undergrowth, which it uses for cover. Each snake claims a territory of an area spanning 5 - 7 miles square, and, as the animal ages and grows, it will eventually fill the entire area with "extensions" of itself in the form of heat-sensitive tentacles. To the casual observer (and any hapless animal that may be wandering through the area), these tentacles generally look like harmless sticks and logs laying on the ground. But the unfortunate prey that happens to brush up against one will find itself caught and dragged into the center of the snake's territory, where the head and body are located. The snake itself is toothless and simply swallows its prey whole, with the help of small, tentacle-like appendages located around its mouth. The snakes themselves vary in size, but larger specimens are surely large enough to swallow humans and deer-sized animals. Long ago there was a seperation in the land of the gods and the deity Baga turned against the others. With their combined efforts, the gods of justice and law managed to seal Baga in the deepest circle of Hell, burried beneath the earth. Despite all his rage, Baga could never manage to break free of his prison because the gods burried him too deep. The only thing which managed to reach the caverns of Hell was his hair, flailing wildly at anybody foolish enough to pass by, eager to sustain his bloodlust while still trapped in his eternal prison beneath the earth. concept: This alien creature burrows under the surface waiting for prey. When the prey is close enough the tentacles surround the victim and direct it to the mouth for consumption. It is also an excellent predator on land where its tentacles act as legs for surprisingly swift mobility. concept: Jellian or "Whip of the Stream"
Inhabitors of tropical esturaries, the Jellian capture all forms of marine life where the intertidal currents hit land. A paralyzing sting from the myriad of tentacles at its base allows this small creature, measuring .5 meter (roughly 1.6 feet), to survive and thrive in their habitat. The male Jellians make themselves look foreboding to any attacker by inflating their air sacs to suggest larger eyes belonging to a large creature as well as for mating. concept: Slow but very reliable, the odafrangian sea-snail provides not only transportation but also marketable products for the itinerant traders of Malistocca: intense red and indigo dyes, eye-jewels, and, of course, the renowned blue leather made from the creatures' shell-skin, coveted for its toughness, durability and suppleness. concept: This tentacle creature lives in a desert environment, stands about 5 feet tall, and has retractable eyes and mouth. For defense, it brings its crablike legs close to it's body to serve as a shield, and its soft body parts can change color to match the environment. I was also thinking maybe the black wart things around its back secrete a poisonous gas that stuns creatures who get within close range. We may have just discovered the cure for every known illness. During our expedition to the uncharted regions of the newly colonized jungle world of Soen III, we have retrieved several specimens of a rather curious species. They dwell in murky pools ridden with diseases, as our terrain analysis demonstrated. Surely, through years of evolution, these creatures have adapted to living in the most hazardous conditions, and this developed a very adaptable and resiliant inmunological system. We have studied their cellular behavior when exposed to new illnesses, and they can manage to counter everything. This, applied to human matters, could lead to the development of the ultimate cure. It should also be noted than the more they develop antibodies for countering illnesses, the more they grow in body size. They also become more agressive and keen. Since they are able to coexist with diseases without apparent harm to themselves, the military sector has shown interest in the possibility of military use of these specimens, using them either to research new bacteriological offensives, or using the specimens themelves as biological weapons. The colorful creature known as the Bugaloo can be identified by its size and resemblance to a turtle, but more noticeably it's numerous amounts of long tentacles that extend from the top of its round back. Bugaloo’s usually hunt at night when the pickledees fly above flashing their blue eyes as a part of mating ritual. The Bugaloo has cleverly adapted markings on its back that it uses to lure the pickledees closer by flashing their distinct mating spectacle of lights and then snatches em up with its tentacles. The Bugaloo also feeds on various vegetation but its main diet consist of the juicy filled pickledees. You can always tell when a Bugaloo has just got done feasting on the pickledees because they cause its tongue to turn blue from their ink-like filling. This large cephalopod lurks beneath the surface of Portugese waters. Its name translates to 'Hand of God' in Portugese (or Sharktopus in Drunk Sailor); a fitting name due to its shape and that victims will often see a bright white light moments before being attacked. The Mão do Deus' skin near its mouth contains photophores which enables it to create a stunning bright white light. It is still unknown to researchers as to the reason the beast emits the light; some speculate that it uses the light to stun prey, while others just claim it's a freak of nature. The creature usually reaches the length of 20 metres (from tentacle to tail) and can weigh in at 2000 kgs. They mainly feed off large fish, whales, and sailors. The Mão do Deus' uses its three suctioned tentacles (arms) to grapple or pull under its larger prey or open 'family value' cans of Beefaroni from Costco. This is definitely a terrifying beast from the deep. concept: The callous "Deadheads" have just recently been discovered in Indonesia where they seem to live close to the sea. The population is urged to stay alert as almost nothing is known about this creature yet. 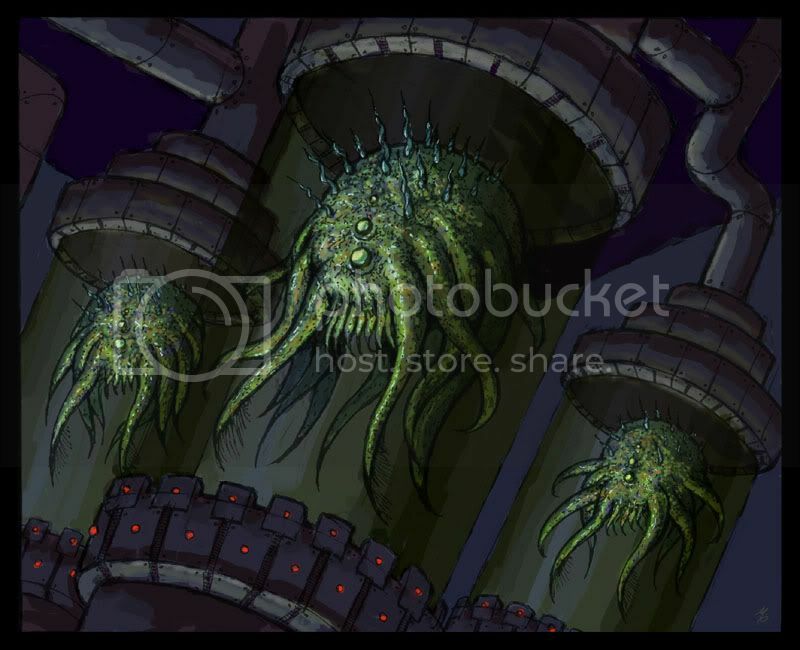 According to frightened eyewittnesses' reports these tentacle beasts are very agile and strongly smell of bromine. Imagine yourself being a gitty 16 year old schoolgirl. Now try and imagine you being a lust object for thousands of manga fanboy desktop perverts spread over the world who are obsessed with underaged girls in schoolgirl outfits(technical term;lollicon). One could try and cover up their skin by using a big sweater!? YES, but 16 year old schoolgirls who watch steamy hiphop video's don't like that!! So now there is "Tentai" savior of the virginity of the underaged schoolgirl!! If you cant get away from your stalker ex boy-friend, loose handed gym teacher or your obsessed kid from science class, just wear your own personal "Tentai". It is firmly mounted around ones waist, and can easily be muffled away under your skirt! When he is needed he will pop up from underneith the skirt and attack the intruder of your personal space. Although the head of "tentai" is not big, it still is one scary mofo! Scary to scum but sweet for your pet or little brother/sister and cute enough to pet every once and a while! The following pic shows Tentai in action when being nice to a little kittycat. Focus is on creature design! We hardly can see your creature? same as ThrillzillA...concentrate on the creature design! I voted for romance because I really liked the way the creature is rendered and the clean and underwater feel to it, the biggest crit is that we cannot see the whole creature but in other hand makes it seem like has been caught in a photo by accident or something and that it is a difficult creature to spot (like architeutis or something). my other voting option would be masque, also liked the one from hurricane and hideyoshi (more because I really dig your style, rather than the creature itself). redhelert appealed most to me for its classic rendering style and subtly dynamic composition. would like to see one with sacs inflated (clever touch, that). good use of "aquaspheric" perspective, too. I voted for bradz cuz his entry was a nice macabre balance between the familiar mans best friend and the bizarre parasitic tentacled nasal organism, a nice blend of completely opposite ideals...Nice Job. mostly because of creature design, you managed to stay away from the cliche tentacle design and implemented the tentacles in a beautiful way...also the atmosphere and coloring is awesome...you did it man!!! Where did you pop out from man....i really dig your creatures...very entertaining entries...great! I voted for masque this time around. 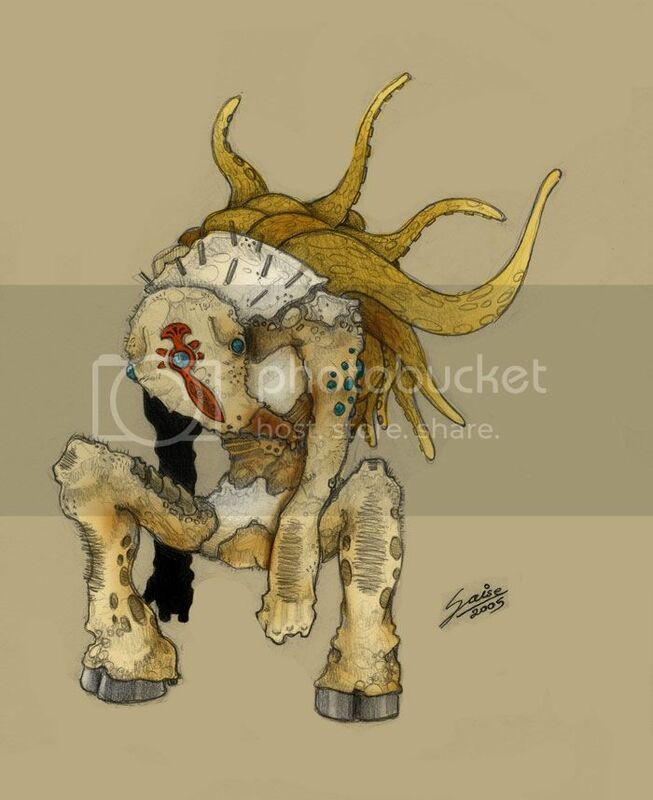 The creature's pretty simple but really effective, and I just like the mood of the piece in general. Also, Carnifex's isn't showing up for me, I'm just getting the "bandwidth exceeded" image. I voted for romance on this one. I really thought the creature was great looking (with an almost 3D rendered look) and was a nice mix between a shark and a squid. Seemed very believable to me. I also really liked VegasMike's and JakkaS's pieces as well. I voted /hurricane.... im no judge of a good creature so I cant comment there but as a striking image... he really hit home. Good pic. Really hard choice... I really liked the ones by Romance, nightfend, VegasMike, Hurricane, Redhelert, and JakkaS. On a sidenote, I'm going to sound like a prick for saying this, but... Hurricane's entry doesn't have a concept. There's still time to include one before the voting round finished. I voted for MIKECORRIERO, because it stood out the most to me. I like the blue highlights a lot and the interaction of the tentacles. Well....tough call on this one - superb entries all around! At first it was Nightfend, then it was Jakkas then Romance then I was romancing the jakkas at night fending off.....um.....fending off nothing, really. Ultimately, Romance got my vote with the stunning visual rendering and concept idea. Would have loved to have seen more of this creature - that's my only crit there. Many thanks for the comments and votes thus far!!! I'm honored, yet again! Goddamn it, you bastards. Stop making it so hard to choose. Wow, great stuff this round. I ended up voting for Nightfend after trying to decide for 45 minutes. Great rendering overall. I can hear the vikings crying now. (or maybe it's the wind whistling between my ears). What I really like about this entry is that you DONT see the whole creature. Anyone who came across this beast while sailing didn't have a chance to see anything but the tentacles. Not seeing the whole beast also allowed for me to imagine what is REALLY lurking beneath the surface. 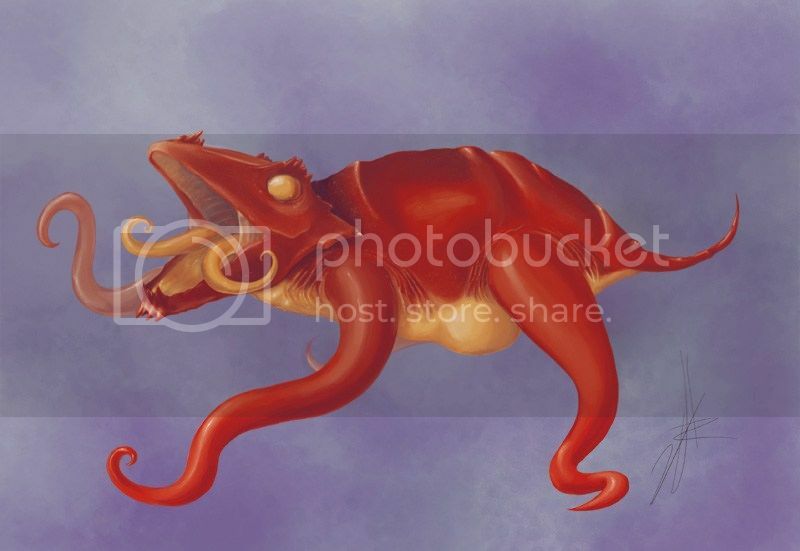 I visualized the creature that lurked in the oceans of old maps. Kraken perhaps? Keep up the great work Nightfend. It was a close race for my vote between MikeCorriero, JakkaS, Masque, Nightfend and Redehlert. Overall, I thought everybody did a fantastic job. To the next COW! silentkitty: yeah i know,stupid photobucket is acting up. you have to right click and copy to see. sorry. my vote to masque-i love the wonderfully calm atmosphere. eeek. awsome entries everyone. I went for romance.. superb.. hurricane almost had my vote..
Too bad Cartoonfox didn't post anything, now he lost my vote to Corriero. And I totally agree with him, these creatures could easily be 'swamp things'. My vote went to Masque. This image has a great storybook feel to it and could have an entire story somewhere in there. I like how the sea merges with the sky and the glow from the light sources creates a calm kind of atmosphere. This creature could be this guys friend, but it has a menacing aspect, as well. The umbrella looks too much like it's from a patio set, though. I can get over that. Just a very nice illustration. Romance: This one has an undersea documentery feel to it. llothcat: It's funny as all hell and it looks mean as all hell. God it's late. Wrapping up some cover concepts for a journal while my wife works on her versions. Kinda fun working on projects together. Just cruising the thread and wanted to say a heartfelt thanks to Foz and Masque for voting for my entry. Many thanks! mmmm where has my avatar gone?? Voted for ThrillzillA, because of the concept, picture is done well,but the concept ist just humorous. The next runner up is masque. People said it allready, the picture is just so calm and nice, that you can easily drift into it. Romance, I had same problem. First I wanted vote for Hurri’s picture but there is no description, so finally I voted for nightfend - same as You Romance. I think, its good painted, and have good story. Maybe concept it’s not so original as Hurricane’s, redehlert’s or Yours Romance (U was my third choice) but I have never voted for nightfend before, so this is my first time. Romance – I want to see whole creature, and I am curious….how it swim? Is it using fins or tentacles? I like also: redehlert’s and masque’s entries. I went for masque.. Great scene and idea, and its a similar style to moebius which is awesome! welldone! I voted for.... well... it is hard to make a decision. I loved the classical look of it, and the scene and the water is nicely done! Loved the scene presented in your painting. To me the creature felt most alive and the creature description empowered this. I liked the coloring as well, real easy on the eyes. 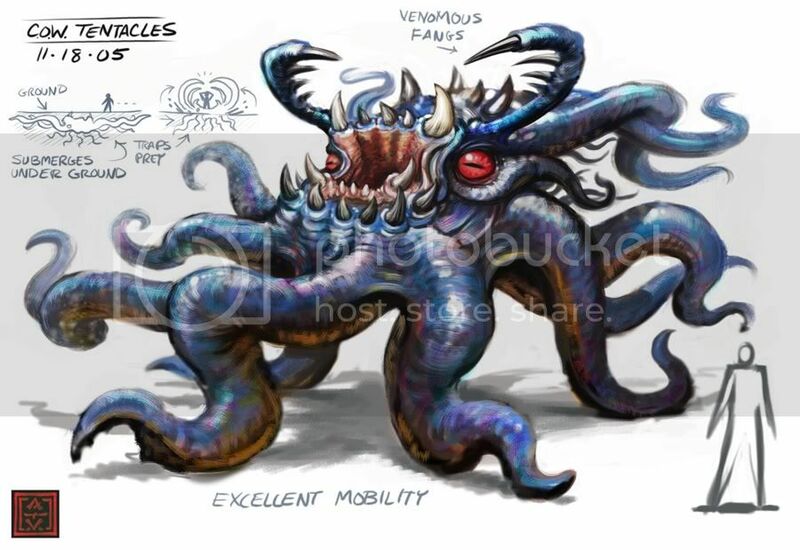 And the fact that it was a jungle tentacle creature was original. So I made a decision and it is: JakkaS! Ey pisc99 thnx for voting for me dude!